SCHAUMBURG, Ill. – Oct. 10, 2011 – Motorola Solutions, Inc. (NYSE: MSI), a leading provider of mission-critical communication products and services for enterprise and government customers, today unveiled the ET1 tablet, the first in an emerging category of enterprise-class tablet computers designed for a variety of vertical markets. The ET1 brings the familiarity and popularity of a consumer-class user experience to a true enterprise-class device that includes enhanced durability, an optional barcode scanner and magnetic stripe reader, hot-swappable battery packs, and secure system software. Key industrial-strength accessories such as secure multi-slot recharging stations are also available. • Running an enterprise-ready hardened version of the Android operating system, the ET1 tablet is designed to be used 24 x 7 by multiple staff members. • Supported by Motorola’s portfolio of enterprise-grade software modules including RhoElements, a new HTML5 application enablement framework, businesses can now quickly and cost-effectively develop enterprise applications once and deploy them on both traditional Windows Embedded Handheld™ and Android-based Motorola devices, allowing for consistent user experiences. • The ET1 incorporates a durable Gorilla Glass™ 7-inch color display, designed for customer-facing applications containing video and images. In addition, the screen bezel can be customized to match the retailer’s brand. ■ Optional hand strap for comfortable full-shift handling • The ET1 tablet will be available with Motorola’s Service from the Start with Comprehensive Coverage program, providing coverage for normal wear and tear as well as accidental damage to internal and external components, significantly reducing unforeseen repair expenses. 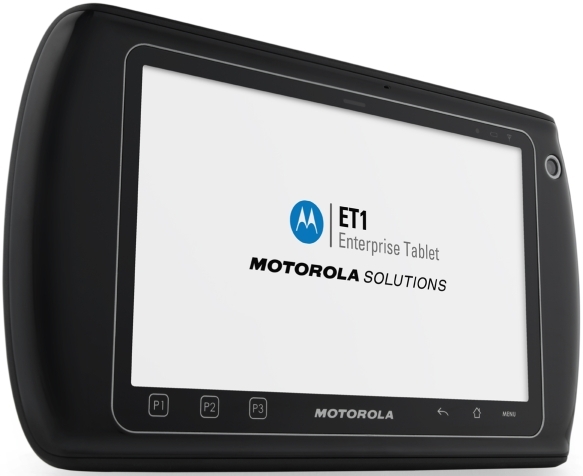 • Motorola Solutions’ ET1 tablet will be available in the fourth quarter of 2011.